Is the Greek word for honey. It is pronounced mæÉLee. In ancient Greek mythology, honey was considered food for the Gods and the basic ingredient of “ambrosia”. Honey is ideal for a healthy & nutritious breakfast. Try it on buttered freshly-toasted pita (or bread); in cereal with milk; in your tea, coffee or milk. 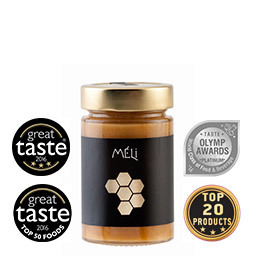 Honey is a natural sweetener; excellent substitute for sugar. Try also as a topping on original Greek yogurt or on ice-cream.